Above average temperatures continued for the third straight month in November. 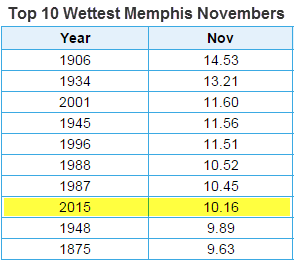 In fact, this was the 4th warmest November on record. The month was also much wetter than average, becoming the 8th wettest November in recorded history, thanks to multiple heavy rain events. 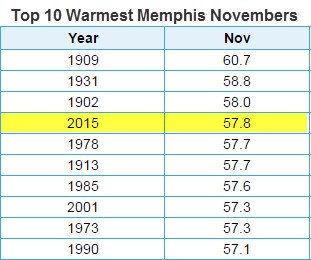 For the year, the average temperature at Memphis International Airport is 65.0°, which is 0.8 degrees above normal. After running a deficit for much of the year, precipitation for 2015 is up to 47.89", which is right at normal (0.05" below average). There were fairly minor severe weather reports in November during a few different events. Wind damage, mainly in the formed of downed trees, occurred on the evening of the 17th in multiple locations across Shelby County as a line of storms moved through. Flooding was reported in western DeSoto County on the evening of the 17th. Also, isolated wind damage occurred in Tipton County on the morning of the 6th and the evening of the 11th. Meteorological fall, defined by the months of September, October, and November, concluded with above average temps and precipitation. In fact, it was the 5th warmest fall on record with an average temperature of 67.2 degrees (3.0 degrees above normal). Precipitation totaled 13.92", which was 1.36" above normal. 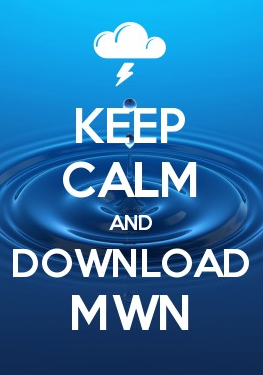 Records set or tied: Maximum low temperature records were set on the 4th (67°) and tied on the 5th (66°) and 27th (63°). Comments: November 2015 was the 4th warmest November on record. Only 3 daily average temperatures were cooler than 1 degree below normal. Eight days were at least 10 degrees above average.